Guess we got so focused on recording shows that we never got around to making the MobileTechRoundup website “mobile device” friendly. Heh…that all changes today! If you direct your mobile device to the podcast homepage, it will automatically detect if you’re viewing it on a mobile browser. Instead of the all the full size glitz and glam, you’ll get a basic text view of the podcast site, along with a direct link to download the latest show. Looking for a prior show? No problem! Just scroll down below the current post and you’ll see the last 10 posts and shows for your listening pleasure. We thought about making all of the prior shows available this way, but after some heavy duty thinking, we all agreed that nobody should have to listen to us more than 10 times in row. Actually, WE were pretty OK with it, but input from the wives and significant others indicate that we talk too much. Who knew? If you’d rather subscribe through iTunes, that’s OK too, the subscription link hasn’t changed. A big shout out goes to Alex King for the awesome WordPress plugin that does all of the heavy lifting here. If you’ve got a WordPress blog and want to make it mobile, stop over at Alex’s site for the plugin. 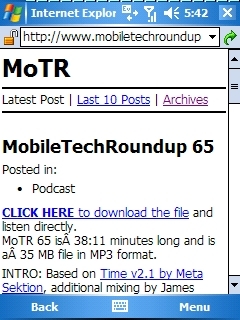 Author adminPosted on August 28, 2006 Categories MoTR News1 Comment on MobileTechRoundup goes….mobile?!? MobileTechRoundup Podcast hosts Dave Ciccone, Kevin Tofel and James Kendrick were invited to appear on the SalesRoundup Podcast #36 to give some mobile tech advice for sales representatives. It was a fun segment and the first guest appearance for the MoTR crew on another podcast. The SalesRoundup Podcast is a great show that offers advice for those involved in sales in a big way. Check it out and let us know what you think of our appearance. BTW, Kevin was using his new voice scrambler for his part on the show just to keep things interesting. We wanted to give a special shout out to all of the podcast listeners because if you didn’t subscribe or listen, we wouldn’t be on any list at all. Your gracious support has made the last 43 shows in the past 6 months worth every minute of our time and for that, we’re sincerely appreciative. MobileTechRoundups exceeds 26,000 downloads in first month! Kevin, Dave and I just put show #10 in the can for release tomorrow and I couldnâ€™t be happier to report that the MobileTechRoundup podcast has been downloaded over 26,000 times in the first 30 days! This is absolutely phenomenal and I want to thank all the listeners who are downloading every show. We try to talk about the mobile tech topics that we think will interest you and if the numbers are the judge then I guess we are succeeding. On the next show we announce the winners of the Channel 9 guys for the contest we just closed and we are announcing a really big contest in the next few days. Thanks for listening, everybody! CYA!! Author adminPosted on December 1, 2005 Categories MoTR News2 Comments on MobileTechRoundups exceeds 26,000 downloads in first month!